"I hope that Christmas time will find you well, without worries and therefore content. I can imagine no other blessings which would tend towards making the Yuletide brighter, and if these blessings are granted, you can ask for nothing more." Ever since 1910, when Mr. and Mrs. duPont began living in their newlybuilt mansion, the holiday season has been a festive time at Nemours. 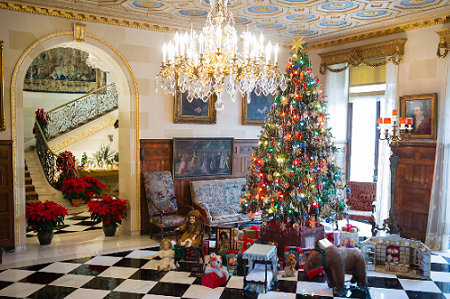 The Christmas decorations at the Nemours Mansion are often inspired by the architecture of the home, the customs of the duPonts or the French influence. Mr. and Mrs. duPont welcomed estate employees and their families for punch, cookies and gifts in the Reception Hall. In later years, Jessie duPont invited children and staff from the Alfred I. duPont Institute, built on the grounds of the Estate as instructed by his Will. The Mansion is also decorated by some of the duPonts’ original decorations, including a German crèche, which dates from the late 19th century. The figures are soft ceramic, unglazed and hand-colored. In addition to their own ornaments, Nemours also proudly displays ornaments made by patients at Nemours Alfred I. duPont Hospital for Children. We welcome you and hope you enjoy Nemours Estate in its entire splendor. Hours (starting Saturday Nov. 17): Tuesday, Wednesday, Friday and Saturday 10 a.m. to 5 p.m.
Entertainment available on weekends and evenings. Check our Facebook and Instagram pages for details.